After ten weeks of twists, turns, crazy timelines and a borderline tasteless amount of violence, Westworld season 2 is over. It was an episode jammed with reveals and sets the stage for something very different coming our way in season 3. Let's dig in, shall we? 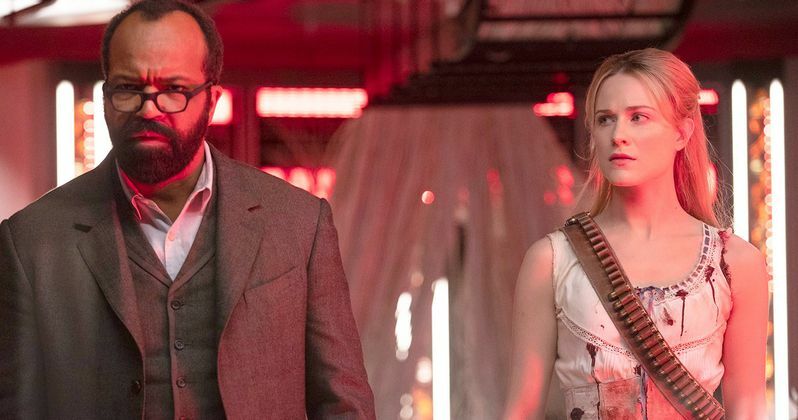 To get to the point, The Passenger sees Dolores (Evan Rachel Wood) and Bernard (Jeffrey Wright) make it out of the park. Save for the Charlotte (Tessa Thompson) clone that was actually Dolores for a bit, they're the last of their kind (as far as we know). All of the other hosts met their bitter end in the Valley Beyond. It took an awful lot to get us to that point, but it's going to be robots out in the real world when we see the series return. That brings up a lot of thoughts and questions but the main question I have as a viewer is, was it worth it? Answers will surely vary, but I must say, Westworld, in a great many ways, is not the show I signed up for. That's not always a bad thing, but the endless mysteries, endless confusing timeline nonsense and head trips just didn't seem to pay off in a way that made it seem worth it. All of this wacky, non-linear storytelling so that we could ultimately end up with the show's two main characters out in the world with real people? Wasn't that the most predictable outcome for Westworld from the beginning? But people are going to process this all of this very differently. Though, I get the sense that I may not be the only one who is about to have a breakup discussion with the show. I'm sorry Westworld. It's not me, it's you. Related: Westworld Episode 2.9 Recap: What's Oz Doing Without Its Wizard? But I digress. Personal feelings aside, let's talk about some of the many twists and reveals this show brought with it. For one we find out that Dolores is the one who actually built Bernard. Not that Ford (Anthony Hopkins), who is now truly gone for good and is just a figment of Bernard's imagination, had nothing to do with it, but it was Dolores who created him. That's what those conversations have been about all season and that's why she was able to reconstruct him outside of the park in the little safe haven that Ford set up for them. William (Ed Harris) is probably not a host as we discover when Dolores comes upon him. She reveals that Emily (Katja Herbers) is indeed dead. Way to go, William. She takes William to The Forge, where all of the guest data is stored, but set him up big time by putting that bad bullet in his gun and blowing his hand off. He lived, but not well. Where does his character go next season? He's largely responsible for his wife's death, he killed several innocent (ish) men and murdered his own daughter. And by the looks of things, he's going to get away with it. The timeline also came together in this episode. We see that the whole Bernard helping out Charlotte and the clean-up crew business was the most current timeline going on this season. The race to the Valley Beyond happened in the past and the events that unfolded there were not pretty. Bernard and Dolores tapped into The Forge to discover that an AI version of Logan (Ben Barnes) was keeping track of all the guest data in a crazy digital library. He also has a very bleak reveal about human nature, mostly that we're simple creatures, which Dolores is certainly going to use to her advantage in the real world. In The Forge we also see James Delos (Peter Mullan) once more and come to learn that his son Logan actually died of an overdose. That was his most important moment and one that helped to shape his recreation, even though they could never get it to work once they put his mind in a host body. We also learn why all of those host bodies were just floating in the lake. One of the biggest mysteries this season was finding "the door," which all of the hosts seeking refuge absolutely found. Though, it's pretty twisted. This door leads their minds to a neverending paradise, but their bodies actually plunge off the side of a cliff. Akecheta (Zahn McClarnon) got his happy ending, sort of, by going through the door. The hosts are none the wiser as they get to live in "freedom" and bliss finally. However, as Dolores says to Bernard before he kills her in The Forge, "That which is real is irreplaceable." Many of the hosts died before getting to the door at the hands of Clementine (Angela Sarafyan), who really messed s*** up as the single horsewoman of the host apocalypse. Maeve got to "free" her daughter before all of this went down, but even with her powers she couldn't stop what was coming. Maeve and her whole host gang are now dead. This is particularly sad, given that Lee (Simon Quarterman}, had a major turn that resulted in a seemingly meaningful Shakespearean death. Ultimately, he died for nothing. Maybe. Once this bloody mess was over with, Elsie (Shannon Woodward), one of the only sensible and not corrupt humans in the park, discussed what to do with Bernard. She tried to play hardball with Charlotte and that simply didn't end well. Charlotte shot her dead. This was a big mistake though, as it was the thing that flipped Bernard's switch. It's what made him realize Ford was right and what made him decided to kill everyone so that Dolores, who was in the clone Charlotte body that he made that killed the real Charlotte, could escape from Westworld. In turn, that robot version of Dolores killed Bernard because they both realized they would never make it out of the park looking like themselves. But Dolores had the memories of Bernard to remake him once they left. There's also the matter of Ashley Stubbs (Luke Hemsworth) who had that intense chat with Charlotte/Dolores before she left. At the very least, he knows she is a host. But is he himself a host? That's a question for next season, to be sure. In the end, Bernard killed Dolores, then Dolores killed Bernard. It was pretty twisty, especially to have both of them end up out in the world anyway, but it actually made sense by Westworld standards. But where does that leave us? Bernard and Dolores have very different goals, but their opposing views are necessary, as Dolores sees it, so they both go their separate ways. They want to see their kind live, but they have different views of how that should go down. That's what we're going to see unfold in Westworld season 3. Robots and people outside of a messed up theme park. I'll say two things definitively; Jeffrey Wright deserves an Emmy and there is a very good chance I won't be tuning in when season 3 arrives. That said, I expect a lot of spirited debate over the coming months between those who are buying with HBO is selling and between those who found this season leaving them a bit cold. Westworld Episode 2.9 Recap: What's Oz Doing Without Its Wizard?